Time to take the training wheels off your jet fighter and take control of the skies this weekend, August 22nd-24th, for the SA Flight School Event. As usual there are special playlists, bonus rewards, and contests to win. More details below and in the full article. This weekend only, you can pick up the exclusive 'High Flyer' Parachute Pack seen in the flyer above, for the skydiver who truly enjoys getting lifted. All you have to do is complete the "San Andreas Flight School Event" Playlist and then head to Ammu-Nation. The High Life Parachute Bag will be available free of charge and, once purchased, you can equip it from your Inventory in the Interaction Menu. As well as the Parachute Pack, you and your wingmen will get double GTA$ and double RP in every Job in the Event Weekend Playlist, win or lose. To get involved, hit the Event button prompt on the GTAV boot screens, or find the Event Weekend Playlist in the Playlists section of the Pause menus, under Rockstar Created. Time to put those aviation skills that you honed at the San Andreas Flight School to test in the field and earn double GTA$ in all Air Races and Parachute Jumps. That includes a batch of new Rockstar-Created Jobs published this week specifically for the new aircraft in the San Andreas Flight School Update, plus new Parachute Jumps designed to make use of the new reserve 'chute. Nothing tightens the pucker factor like flying low under one of the many bridges in the San Andreas area. All weekend, such flat-hatting while playing Air Races will get you Double RP. Or it will leave you too dead to worry about the consequences. Let's face it: you've not earned your wings only to then have to spend your leisure time slumming at sea level with everyone else. So all weekend, get a 25% discount on the high rise Del Perro Heights Apts 7 & 20 and 0120 Murrieta Heights Properties. Each includes a 10 car garage to store all of your exotic rides befitting a true flyboy, including the brand new Invetero Coquette Classic. Plus, in a rare act of philanthropy, Lester is willing to locate planes and choppers for you all weekend, free of charge. Just give him a call, select 'Locate a Plane' and 'Locate a Helicopter' and ask no questions about ulterior motives. Prefer your choppers manned and delivered? Get half price Helicopter Pickups all weekend courtesy of Merryweather. 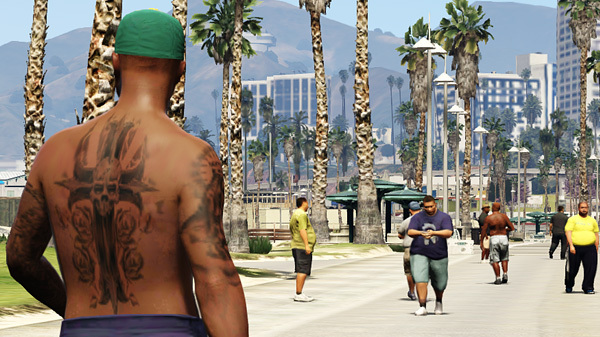 Gangs have assembled around San Andreas International Airport Hangar, and the Sandy Shores and Grapeseed Airfields. These special Gang Attacks will yield 2X RP and bonus GTA$ all weekend, so get over there and defend America's right to fatuous air travel. Your dogfight victims won't be the only things falling from the sky this weekend: look out for special Crate Drops containing extra GTA$, RP bonuses, Miniguns, RPGs and Sticky Bombs between now and Sunday night. Whether it's capturing one of your friend's aerial exploits or the whole Crew about to board the Buckingham Mil-Jet, Rockstar is looking for your most inspiring and amusing pictures featuring the new content in The San Andreas Flight School in the #FLIGHTSCHOOL Snapmatic contest. Their favorite five will each win their authors GTA$1M and a MILEHIGH vanity license plate for their in-game vehicles, plus they'll be featured right here on the Newswire. To make your shots eligible for entry, simply log in to Social Club and tag them #FLIGHTSCHOOL between now and the end of Sunday. The sky is the limit in the Creator contest, where Rockstar is looking for user-created Air Races to test even the saltiest pilots. They'll choose 5 favorite Jobs to be Verified and their creators will receive GTA$1M and an exclusive AVIATOR license plate. Just tag your custom-made Air Race Jobs with #FLIGHTSCHOOL in Social Club between now and Sunday night to be eligible in the competition. At 4pm this Friday August 22nd, the Rockstar Games Official Event Weekend Live Stream will be on the air, playing brand new content from The San Andreas Flight School Update. They'll be joined by very special guests Little & Cubed aka Martyn Littlewood and Dan Nerdcubed who are preparing some custom challenges featuring the new Flight School planes and vehicles and will be challenging the Rockstar Devs to a live 2v2 dogfight around Los Santos & Blaine County airspace. As usual, Lazlow and the Rockstar Broadcast studio team will be manning the flight deck and they'll be streaming the show across the Social Club Events page, the Rockstar Games Twitch Channel and YouTube Channel. Rockstar will be giving away 20 deluxe GTAV & Rockstar T-shirt Prize Packs including the Trevor Philips Industries Tee, San Andreas Federal Reserve Tee, Los Santos Lifeguard Tee, Republican Space Rangers Tee, Bugstars Logo Tee, Los Santos Tee, the GTAV & V Logo Tee, Kifflom Tee, Rockstar Rolling Long-Sleeve Tee, Rockstar Mason Tee, and the Rockstar Flowers Tee. You can enter to win right now through Sunday right here. See Official Rules. Have fun and find your wingman in the forums! This has been extended into tomorrow night due to the PSN/XBL issues. 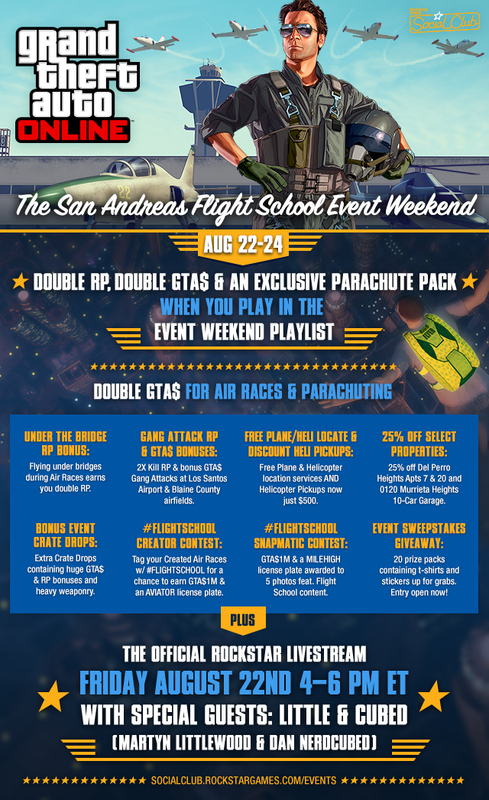 SA Flight School Event Weekend - As usual the new update for GTA Online will have an associated event weekend - this weekend.